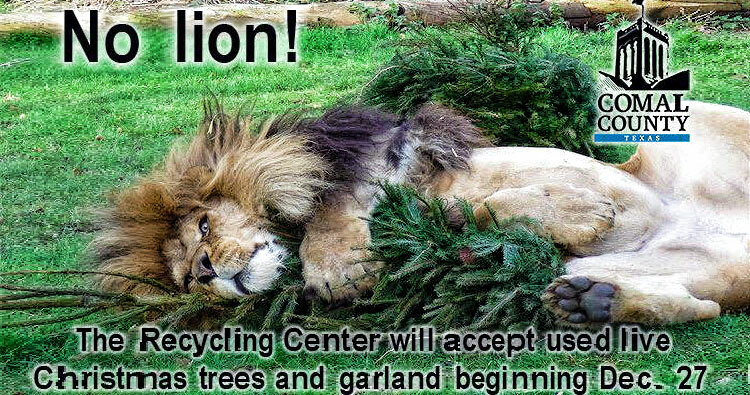 Comal County Recycling Center will accept used live Christmas trees and garlands beginning Tuesday, Dec. 27. Comal County Commissioners Court authorized the service at its weekly meeting on Thursday, Dec. 2. The center will accept, free of charge, any used live Christmas greenery through Jan. 20, says James Tart, manager of the Moe Schwab Recycling Center, 281 Resource Dr., New Braunfels. Residents are asked to remove tinsel, ornaments and other decorations before bringing their greenery for recycling. All other brush will continue to be subject to the usual recycling fees. Artificial trees and greenery are not accepted for recycling. Fore more information, call 830-643-3781.